While many books are hyped by publishers, publications, and readers, most rely on word of mouth to find an audience. A few months ago. a publicist told me about an upcoming novel she thought I would like. And indeed the description sounded intriguing; on paper it played to a lot of my fictional preferences. I asked her to send me a copy. Time passed as I focused on teaching and photography and only managed to read a few books during the fall semester. I still had the book on my TBR list, but the publication date of November 10 passed without my reading it. In the intervening months, I had not seen or heard a thing about the book, so it was definitely flying below the radar. Once Christmas vacation arrived, I was determined to read the book, as I’d promised I would. Now that I’ve read Charmed Particles, I regret not doing so as soon as it arrived. It is a thought-provoking novel of ideas that will charm you with its soft touch. It deserves far more attention and acclaim than it is getting. Chrissy Kolaya’s novel is set in a small town just beyond the edge of the Chicago suburbs during the 1980s and concerns the intersecting lives of two families. Randolph and Rose Winchester live in the same neighborhood, Eagle’s Crest, a recently built subdivision near Abhijat’s lab. Randolph is a travel and adventure journalist and photographer who is gone much of the time, while Rose concentrates on raising their precocious daughter, Lily. Rose is not just comfortable with her unorthodox marriage, but proud of it. She and Lily appear to manage quite well during Randolph’s long absences, which are punctuated by his fascinating letters. The two daughters, both brilliant and driven by their ambitious, eccentric parents, become friends and thereby begin to draw the two very different sets of parents together. So we have two self-absorbed husbands, either physically or emotionally absent, contrasted with two wives who are left to their own devices and eventually set off on journeys of self-discovery. Sarala comes out of her role as the dutiful Indian wife to become a successful Mary Kay saleswoman, while Rose decides to run for mayor of Nicolet. She grew up in Nicolet when it was just a farm town and believes she is the right person to guide it into a future full of economic and social challenges. These charming particles begin to collide when the U.S. Department of Energy announces that it is considering building a Superconducting Super Collider at the Nicolet lab or another location. For Abhijat, this represents a chance to make his dreams come true. For Rose, stopping the construction of the incomprehensible and seemingly dangerous SSC becomes the centerpiece of her campaign. The two families suddenly find themselves in opposition. The lab, which has been an ideal “corporate neighbor” to this point, attempts to explain to townspeople what the SSC involves and what it could mean to the town economically and in terms of international recognition. But suspicions run high among the residents, most of whom do not seem to understand (or perhaps even to want to understand) what the SSC does. Rumors run rampant about radiation, potential explosions, and the fact that the SSC will run in a loop under their houses and the town itself. Attempts by lab management to allay the residents’ concerns about safety are ineffective at best and counterproductive at worst. Even the fact that most of the lab employees like Abhijat live in Nicolet and would be as much “at risk” as everyone else if the government builds the SSC in Nicolet fails to tamp down the rumors and suspicion. Maybe the lab is not the innocent testing facility management claims it is, after all. Rose Winchester takes full advantage of the townspeople’s wariness to distinguish herself from the popular but seemingly feckless incumbent, who has come out in favor of the SSC. To Kolaya’s credit, she handles this divisive issue with sensitivity, presenting both sides in an evenhanded and compassionate manner. The physicists are not presented solely as socially inept eggheads, nor are the people of Nicolet depicted as simply ignorant, paranoid, and opposed to scientific progress. These are three-dimensional people whom we recognize, and all of them are sympathetic. The other thread of Charmed Particles is the coming of age story involving Meena and Lily. We watch as the two gifted students thrive while leaving their peers far behind. But, as with the calm, perfect exurban town of the early portion of the book, change is inevitable, and the girls slowly grow apart in surprising ways. Kolaya explores the intellectual, social, and emotional lives of the girls, which exist completely apart from the lives of their otherwise attentive parents. Kolaya reminds us that so much of parents’ lives remains a mystery to their children, as do the children’s lives to the parents, usually because children are determined to maintain a secret life. The opposing forces in the various plot lines come together seamlessly in the last third of the book. But the characters and events never seem stereotypical or obvious; there is more to everyone than meets the eye in Charmed Particles, and that is one of its main pleasures. The battle over the lab brings out the best and worst in people but also serves to move lives forward in unexpected but necessary ways. It is the catalyst for changes of a different type than those involved could have foreseen at the start. No one is left unaffected by the collision of particles in this story. Sarala and Rose expand their self-concepts, while Abhijat and Randolph learn much-needed lessons about their roles as husbands and fathers. Kolaya also deserves kudos for the quality of her writing. Her prose is smooth and fluid, and the narrative voice she has created is as satisfying as floating downstream on a sunny day. You will find yourself halfway through the book before you look up to see what time it is. 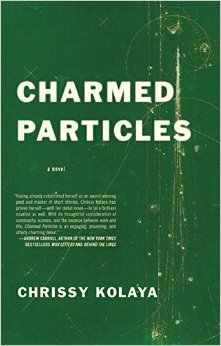 Charmed Particles is that rare novel that lacks even one clunky sentence. This is a novel that deserves a wider audience. Kolaya has written a story with the perfect blend of ideas and people, and readers will find themselves thinking about all of them when they close the book. One of the things I love about reading blogs is exactly this, the word of mouth of sharing unknown novels. I’m passing it on and adding it to my TBR list. Love to pass it on when it comes to unknown or under appreciated works. Great review. Thanks for sharing. This one looks like it’s worth checking out. Didn’t you publish this review in late December? I swear I’ve read it recently. Indeed I did. You have a good memory, or you checked to be sure. 😉 I was talking to Chrissy Kolaya last week (she’s working on a guest blog post for me), and I decided to re-post my review to try to reach those who missed it before, as well as the many new readers I’ve picked up recently. Wendy Fox’s essay received a ton of views that led to new subscribers, and I want people to know about this book that I really enjoyed and admired. Read it! I have a really good memory! The detail that stuck out to me was the Mary Kay part. Where I come from, Mary Kay means independence for women who may not have any other form of income because they’re maintained marriages and raised children. It especially stood out because it was an Indian woman who decided to join the business. To be sure I wasn’t insane, I Googled your post. So glad it’s still you!